This week, Kristine Simpson and Julia Kent answer a big question: how can young PR professionals get rid of any negative PR stereotypes. A question, Kristine asked while she attended Conversations 2013, the CPRS National Conference in Gatineau. As you go through the lessons below click on the bold links. They will direct you to the full interview on YouTube. Evan Solomon, a reporter by trade, reminded us that the PR industry lacks authenticity. Lack of authenticity results in mistrust. He says we need to get that trust back by being spontaneous and breaking free from canned messages. On that note, Kristine reminds our readers it is all about building relationships and makes reference to an article called Media Relations 2.0. The standard news release is dying, build a relationship with journalists instead. Dan Tisch says we too often define ourselves as the things we do – i.e. media relations, social media – when we should be looking at the value of what we do. Dan also encourages young pros to make business literacy your number one goal in your education and training. Understanding the business of your organization will help you understand the value PR brings to an organization. Terry Fallis quotes the first line in his new book, Up and Down, “Welcome to the dark side,” says the agency manager to the new recruit. Terry says the image that PR is the dark side still exists and encourages young pros to not just do PR for their companies, but for the PR industry as well. Ira Basen, a producer with CBC, says we have to find out what the negative sterotype is and thens imply stop doing it. but in general, he says we should be truthful and honest. Ira also reminds young pros that this is a big burden to carry on one person’s shoulders. We shouldn’t be responsible for the industry’s reputation, just our own. If everyone worries about their own reputation and makes an effort to do good PR, then the industry will grow. Alexandra Samuel makes reference to a familiar idea: breaking down the silos. She says young pros enter the work force in a silo – the social media expert. But social media is more than just a job these days, it is our entire industry. She encourages young professionals who get stuck in the social media role to remind your superiors you are more than just a tweeter. You are building relationships. Redefine what we do from a service to value. We look after the company’s reputation, that is valuable. Reflect the values of an organization through our communications. PR can be the gateway to showcasing the value of trusting an organization. Call out bad practice. Don’t let people get away with bad PR, because it is not PR, it is just lies. Remind the world that PR does more than just communications for an organization, but often we are the ones behind the corporate social responsibility initiatives, helping local and global communities. Be part of a professional organization where we can work together towards international standards. Everyone in a professional organization such as CPRS or IABC should hold each other accountable. Finally, don’t let this blog post just sit here. Start a conversation with your boss, your peers, your colleagues, your friends and see how you can change PR and eliminate any negative stereotypes. 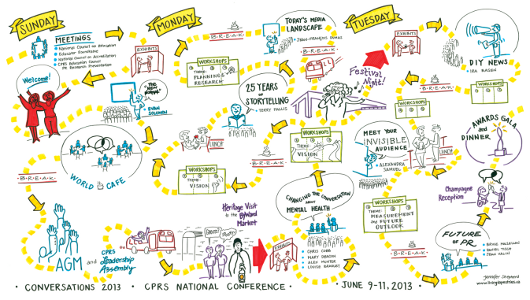 You can get full access to all the content from Conversations 2013 through our Facebook tab, on our Pinterest board or on the #CPRS2013 YouTube playlist. We want to hear from you. What PR would you do for the PR industry? What do you do on a daily basis to eliminate any negative PR stereotypes? Post your comment below or on our Facebook Page, or on our Google+ page, or in our LinkedIn group, or on Pinterest, or send us an email at youngprpros@gmail.com, or send us a message on Twitter @youngprpros, @kristinesimpson or @kentjulia. This entry was posted in Young PR Pros podcast and tagged #cprs2013, alexandra samuel, bruce maclellan, communications, conversations 2013, CPRS, cprs ottawa gatineau, dan tisch, evan solomon, future of PR, ira basen, jean valin, julia kent, kristine simpson, marketing, PR, public relations, stephanie lawrence, terry fallis, vince power, young PR professionals, young pr pros, young professionals, young pros by Kristine D'Arbelles. Bookmark the permalink.